The former co-owners of YUKOS, once one of the largest oil companies in Russia, are currently on trial in Moscow. In 2005, the Meshchansky court in Moscow sentenced Mikhail Khodorkovsky and Platon Lebedev to lengthy prison terms for tax evasion. Now Moscow's Khamovnichesky Court will have to determine whether there is any truth behind the accusations that the disgraced oligarchs misappropriated government shares in the Eastern Oil Company and 350 million tonnes of oil. They are also accused of legalizing illegally acquired assets valued at over 450 billion rubles and 7.5 billion dollars. The essence of the accusations against Mikhail Khodorkovsky and Platon Lebedev, leaders of the criminal group called YUKOS, is that they stole all the oil the company produced in its ten years of existence and legalized the stolen money. To put it very concisely. During his first trial Mikhail Khodorkovsky was kept in the metal cage. At first, few people believed that Khodorkovsky and Lebedev would stand trial a second time. The Prosecutor General's office did threaten to charge the disgraced oligarchs with new crimes, and a statement to this effect was made back in 2004, but things later died down. Khodorkovsky and Lebedev were sent to penal colonies at the other end of the country. One went to Krasnokamensk, near Chita, and the other to the village of Kharp (Yamalo-Nenets autonomous region). News occasionally filtered through from these places. It was usually that the prison administration had imposed some punishment on Khodorkovsky and that court hearings had been instituted to get the penalty removed. One such episode deserves special attention. In March 2006, Mikhail Khodorkovsky was put in a punishment cell for violating the conditions of his sentence. He and another prisoner, Alexander Kuchma, had been drinking tea in the wrong place. Some time later, Russian information agencies reported that Kuchma had attacked the sleeping Mikhail Khodorkovsky with a knife. The injuries were minor. Somehow the story was hushed up. Then, in August 2008, it was reported that prisoner Kuchma had filed a lawsuit for half a million rubles against Mikhail Khodorkovsky. The plaintiff claimed that Khodorkovsky had allegedly tried to force Kuchma to have sexual contact with him in the punishment cell, but Kuchma had refused. After this, life in prison got worse for Kuchma, the conditions of his imprisonment deteriorated and he was eventually sent to Vladimir Central Prison. All this caused the plaintiff moral and physical suffering, so Khodorkovsky was called on to pay him half a million rubles in compensation. But there was no evidence to support this claim. When the Meshchansky court investigated the claim in February 2009 (shortly before the investigation of the new case began), it did not find in favour of the plaintiff. This decision was not appealed. Mikhail Khodorkovsky's lawyers explained that the lawsuit had arisen because the authorities wanted to compromise the disgraced oligarch before the new trial. They claimed that Kuchma was acting on behalf, and at the instigation, of the Federal Penitentiary Service (FPS). In confirmation of these claims they alleged that it was FPS officers who helped the illiterate and mentally ill Kuchma to write and print out the petitions. They paid the state duty for court delays and helped to establish the place of residence of the defendant, in order to file the suit at the correct court (Meshchansky). The FPS issued no comment on the lawyers' allegations. Khodorkovsky and Lebedev, who were sentenced to eight years' imprisonment, were not held at the penal colonies for long. 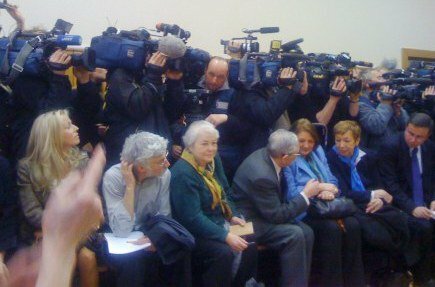 On 20 December 2006 the lawyer Natalya Terekhova came to see her client and was amazed to discover that Mikhail Khodorkovsky was not at the Krasnokamensk prison. Platon Lebedev, who was being held in Kharp, had also "gone missing". It transpired that both had been moved to Chita in great secrecy and put in an investigation cell. This is regarded as the beginning of the second Khodorkovsky case. New charges were brought against Khodorkovsky and Lebedev in Chita. The investigation period was extended and then restricted; new volumes and documents were submitted. Khodorkovsky's lawyers claim that there were numerous violations, but only one was fundamental - the investigation was not supposed to be held in Chita. Initially the courts agreed with this. But in the end the prosecutor's office countermanded these decisions, which had already come into legal force. Attempts to make sense of these charges were doomed from the start. Mikhail Khodorkovsky, Platon Lebedev and their numerous lawyers are still unable to understand exactly what charges are being brought against the businessmen. The first episode is connected with the misappropriation of a block of shares in the Eastern Oil Company. Since the 10-year statutory limitation period on this case expired in autumn last year, it should not actually have gone to court at all. But the leader of the investigating team did not want it excluded from the case. The main charge is considered to be the theft of 350 millions tonnes of oil from YUKOS production enterprises - Samaraneftegaz and Yuganskneftegaz - and Eastern Oil's Tomskneft. It is hard to make sense of this charge. 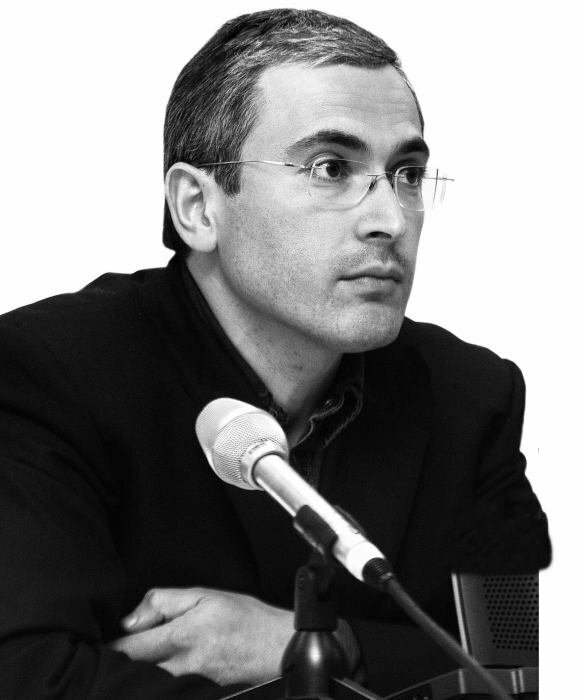 Mikhail Khodorkovsky held a controlling stake in YUKOS. The oil was produced by "daughter companies", which were 100% owned by the "mother company" (YUKOS). So Khodorkovsky stole from himself and Lebedev (the biggest shareholder in YUKOS) exactly what the YUKOS daughter enterprises produced from 1998 to 2003. In other words, everything. "I have been charged with expropriating 350 million tonnes of oil in secret from the owner. You can imagine, your honour, the barrel, cistern or wagon that would be needed. But these geniuses of investigation and the law are talking about 350 million tonnes of oil, i.e. rolling stock that would go around the equator three times! It's not surprising they can't even explain their thoughts, let alone prove anything." Platon Lebedev was no less categorical in his statements, but much more emotional: "From the standpoint of criminal procedural law, this is not a charge. It is a schizophrenic fabrication. Not only do I not admit my guilt. I declare that the prosecutor's office together with the investigation team has committed a crime by making these false charges against someone known to be innocent." Finally, Mikhail Khodorkovsky and Platon Lebedev are accused of legalizing dishonestly acquired funds. According to the charge, the former business partners "laundered" 450 million rubles and $7.5 million. Platon Lebedev spoke about this during the hearings. He told the court that he did not understand how one could examine the charge of legalizing dirty money unless and until the actual fact of criminal activity had been established. Until there is a sentence that has come into legal force stating that a person has stolen something, it cannot be said that he has legalized stolen goods. However, most of the questions raised by the defendants and their lawyers remain unanswered. To all requests for clarification the prosecutors reply that the charges have been "set down in the most comprehensive and easiest form to understand". The new charge against Khodorkovsky and Lebedev is, among other things, based on many documents containing absurd factual errors. As an example the defence highlighted the low quality of translations of international business correspondence adduced as evidence. For instance the translator misunderstood the word "products" as the names of several countries of Asia, Africa and Latin America. There are also dates here such as the 32nd of December, the 33rd and 36th of December. This one of Lebedev's favourite subjects for sarcastic comment, and he frequently reminds the prosecutors of another absurdity. The investigator is either incompetent or simply ignorant, because he describes Gibraltar as an island. Lebedev said in court "If you tell me, your honour, where, in which galaxy or on which planet, the Island of Gibraltar is located, I will admit that I am guilty of all these crimes." He was supported by Khodorkovsky, who asked: "How can you steal oil ‘by transferring it to the balance sheet?' This way of stealing oil by writing down figures, without any need to pump it into a pipe, is impossible without telekinesis. If someone actually did this under my management, and the state prosecution can explain to me how it was done, then I am ready to admit my guilt, because this is such an incredible scientific discovery that - well, bugger it, I don't mind going to jail for it." The second case of Mikhail Khodorkovsky and Platon Lebedev is being heard at the Khamovnichesky court in Moscow. Before the start of hearings, everyone was joking about this. Some years ago the courthouse and the actual court where Khodorkovsky and Lebedev are now on trial was used for filming an episode from the comedy "Mimino", a hugely popular film throughout the former Soviet Union. The hall has changed somewhat since then. Before the hearings a glass cell was quickly installed instead of the cells with bars that are traditional for Russia. 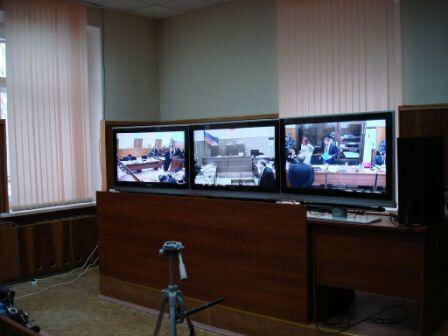 Several video cameras and microphones appeared - an innovation to facilitate the work of the journalists. On the lower floor there is an entire hall for us to watch the proceedings broadcast by video. But we didn't get to enjoy this for very long. At one point on the day when the prosecutors planned to begin presenting evidence, the journalists came into court and found an unpleasant surprise: the court had forbidden broadcasting to the special press hall. This was at the request of the state prosecutors, who had told the judge it was now very important not to let potential witnesses know what was going on in court. The journalists were told that special efforts were being made for them, because it would be easier to follow the hearing and "get the feeling" of the trial from the courtroom. Our attempts to convince the prosecutors otherwise were unsuccessful. At the beginning of the hearings we witnessed unprecedented security measures. The area around the court was controlled by policemen, and there were over 100 of them. Anyone who wanted to walk along the lane past the entrance to the court building had to show documents. You could have been forgiven for thinking that it was not two businessmen who were being put on trial for economic crimes, but a band of terrorists or an overthrown dictator. Now, two months later, everything looks much more modest,though there is still a bus with OMON troops outside the court. Special officers of the Federal Penitentiary Service with automatic weapons are still stationed at the entrance to the courtoom. However, anyone who wishes may enter the courtroom. No matter that this means there is often not enough room there. Journalists remember wistfully how good it was to be able to watch the video broadcast. Sympathizers come to the Khamovnichesky Court every day. They bring flowers and the lawyers put them on their tables, which makes the defence area look very decorative. No one brings the prosecutors flowers, and their tables are usually covered in papers. Anyone may enter the courtroom and this means it is often overcrowded. There are eight lawyers defending Mikhail Khodorkovsky and Platon Lebedev at this trial. Lebedev's team of lawyers is practically the same as it was during the first hearings at the Meshchansky Court: Elena Liptser, Evgeny Rivkin and Vladimir Krasnov. But there have been significant changes in Khodorkovsky's defence team. Unofficially it is led by Vadim Klyuvgant, who joined the case one year ago, but Yury Shmidt and Karina Moskalenko are still considered the key lawyers. Elena Levina is also familiar to journalists from the last trial, but Natalya Terekhova, who is now responsible for procedural matters and communications with the press, only came into the limelight when Khodorkovsky was sent to prison. There are four lawyers for the prosecution. Everyone remembers Dmitry Shokhin from the first hearings. He was promoted after the court found against Khodorkovsky and Lebedev. He now heads the organisation and analysis section in the Chief Directorate of the Prosecutor General of the Russian Federation's office, which deals with the work of prosecutors in criminal investigations. Valery Lakhtin has been the supervising prosecutor throughout the YUKOS case. Gulchakhra Ibragimova is also familiar to journalists, but not in connection with the YUKOS case. Comparatively recently she appeared for the prosecution at the trial of the murderer of Andrei Kozlov, the first deputy chairman of the Central Bank of Russia. Valentina Kovalikhina is a dark horse and little is known about her. Revealingly, unlike Shokhin, Lakhtin and Ibragimova, she is not a member of the Prosecutor General's office. She is on the staff of the Moscow City Prosecutor. 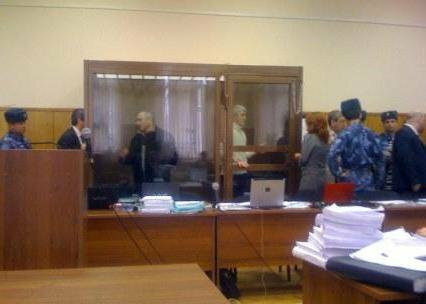 On the first day of the court hearings the defence filed an objection against the prosecutors Shokhin and Lakhtin. The lawyers for Mikhail Khodorkovsky and Platon Lebedev have waged a long procedural battle against Dmitry Shokhin and Valery Lakhtin. It was Shokhin who represented the state prosecution during the examination of the first case at the Meshchansky Court. Lakhtin has been the supervising prosecutor for the last few years and the defence was unhappy that he upheld all the actions of the investigators that the lawyers were trying to appeal. 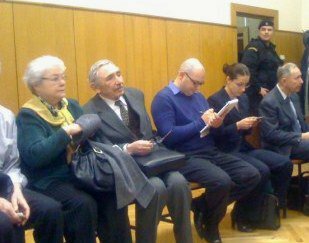 Mikhail Khodorkovsky's parents regularly attend the court sessions. "It's all pointless, Platon Leonovich, we'll do things the way we've planned." But the court stayed true to itself, and rejected the objection. Everyone has got used to the cut and thrust of remarks between the defence and the prosecution in this trial. Lawyers point to the non-professionalism of the state prosecutors; they and the journalists make fun of the way the prosecutors present their evidence, read documents and pronounce English words. The prosecutors, in turn, say that the defence is disrespectful of the court and plays to the gallery, an audience that is "specific and partisan". The defence is also accused of dragging out the hearings. The second stage has begun at the Khamovnichesky Court of what journalists have called "the prosecution readings". The first stage was in April, when prosecutor Valery Lakhtin read out the indictment over the course of eight days. This procedure exhausted almost everyone present, including Lakhtin himself, who constantly stumbled over the numerous names of foreign companies that worked with YUKOS. Journalists were particularly concerned that the state prosecutors would read out not only the decree charging the former owners of YUKOS, but would decide to read out the indictment in full, all 14 volumes of it. When Lakhtin finally came to a halt and said, in reply to a question from the judge, that at this stage the state prosecutors had nothing more to say, there was a barely concealed sigh of relief in the hall. What is happening in the trial at present is very similar to the reading of the indictment, only they call it ‘presentation of evidence in support of the charge'. The law actually states that evidence must be investigated. The prosecutors understand this word differently, and simply read out the criminal files. No one explains what episode each document belongs to, and what relation it has to the case. The charters of companies registered in Cyprus and the Isle of Man are read out in their entirety in court, along with the minutes of shareholders' meetings (ordinary and extraordinary), meetings of YUKOS daughter companies, extracts from the register of shareholders and contracts. Including a letter from one employee of a company in the Isle of Man to another, where he says where he has left his apartment keys behind. What are the prosecutors trying to prove with all this? I asked Lakhtin to explain this off the record. He pulled a conspiratorial face and said that in fact the prosecutors had brief analytical notes on all the files they were presenting, but he couldn't talk about this or explain anything right now. It's all part of their tactics. The prosecution may, of course, have an ace hidden up its sleeve, but judging by what has been read out so far, they are currently actually proving that YUKOS was not an organised criminal group involved in secret and illegal machinations (for this is the main idea of the new charge), but a company working legally on the market. It has recently become known that the European Court of Human Rights has upheld Mikhail Khodorkovsky's claim of illegal arrest and detention in the first criminal case. The Court will issue a ruling on the case after 10 July. Incidentally, an opinion was delivered in 2007 on a similar claim by Platon Lebedev. A board of seven judges found that his rights had been violated, and charged Russia to pay the former co-owner of YUKOS 3,000 Euros moral damages and 7,000 for legal expenses.